We have the experience in managing progressive tools. Current size is limited to 1500x650x450 mm. 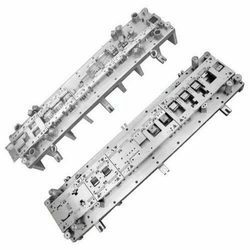 Due to the support of our modular manufacturing unit, we have been able to provide an impeccable array of Progressive Press Tool that is developed with high precision by our skilled professionals. We have expertise and knowledge in designing and manufacturing Progressive Press Tools as per customer specifications and requirements. All these press tools are manufactured by using high quality raw materials and cater to diverse industrial requirements. These can also be fabricated in accordance to the requirements specified by our clients. We are specialised in Design and Development of the progrissive tools & dies from tiny electronic parts to higher tonnage large components. Because of the strengths we have in designing progressive tools we ensure the on time delivery with quality dies. We take up crical parts as challenge for us in development. 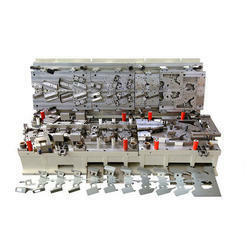 Progressive tooling is designed and manufactured as per customers component. We use high quality raw material and sophisticated manufacturing process to ensure maximum life and high productivity. We also offer option of coil feeding and striking type tool.